The stock market saw a bump Friday afternoon after news broke that Steve Bannon would be leaving his role as President Donald Trump's chief strategist. The Dow Jones Industrial Average gained more than 60 points in 20 minutes after news broke that Bannon was likely out, Axios reported. The market increase continued with another mini bump an hour later when Maggie Haberman of the New York Times confirmed Bannon was out. 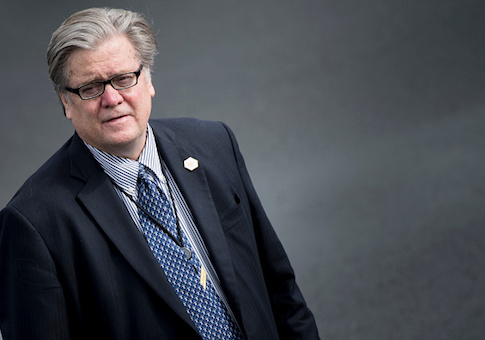 Bannon made headlines this week after The American Prospect published an interview in which he contradicted Trump and openly criticized his now former White House colleagues. Rumors swirled of Bannon being ousted after Trump made allusive comments about his chief strategist during a Tuesday press conference at Trump Tower. "Look, I like Mr. Bannon, he's a friend of mine," Trump said. "But Mr. Bannon came on very late, you know that." "I like him. He is a good man. He is not a racist, I can tell you that. He is a good person," Trump continued. "We'll see what happens with Mr. Bannon." This entry was posted in Politics and tagged Donald Trump, Economy, steve bannon, Stock Market, Trump Administration, White House. Bookmark the permalink.